There seems to have been a little bit of worldwide confusion this week over whether one of our greatest world treasures, has recently turned into the world’s biggest coral grave. The Great Barrier Reef was recently declared dead in an ‘obituary’ written by food and environmental writer Rowan Jacobsen and published by American magazine Outside. The article stated that the reef had been killed off by coral bleaching and that no effort was made to save it. Jacobsen states that the reef was 25 million years old and that it “passed away in 2016 after a long illness”. Although the article contained no informed opinion or scientific declaration of the reef’s passing, the article was shared repetedly across social media, and a few too many people took Jacobsen’s words as cold, hard fact. Hmmmm. You’d think that if this were true, that if the greatest living organism on the planet and Australia’s number one tourist attraction and environmental treasure had died, it might have featured on the Australian news. Maybe. It’s still unsure whether Jacobsen was writing with hyperbole in the hope of creating social awareness, or he actually believes his preaching that the reef is no more. Either way, this widespread misinformation is greatly concerning to scientists. Coral reef expert Kim Cobb, told The Guardian that this type of reporting is more dangerous than helpful. And it certainly doesn’t help that news sources such as The Sun and The New York Post are jumping on the lack-of-research band-wagon and publishing the news that the Great Barrier Reef has died. 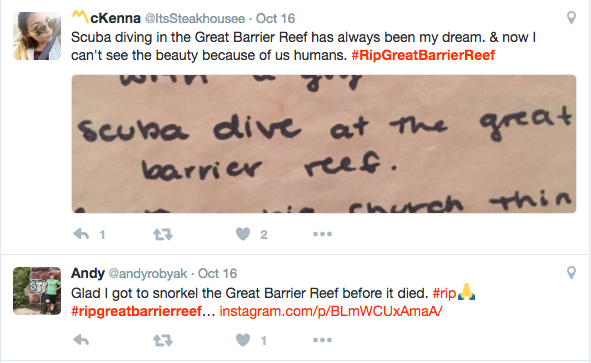 If people think that the reef is dead, they will stop caring about it. But this is the time people need to care the most. The reef is under a lot of stress due to mass coral bleaching and acidification. Around a quarter of the reef’s coral has died. However, there is still plenty of reef fighting to survive. And there are plenty of people fighting with it. But to say that “no such effort was made” to help save the reef undermines all of the relentless work environmental and Indigenous groups, scientists, locals and even politicians have done and continue to do to help the reef remain as alive as possible. There is a lot of effort being made to help save the reef, and the reporting of untrue information is not helping this effort. 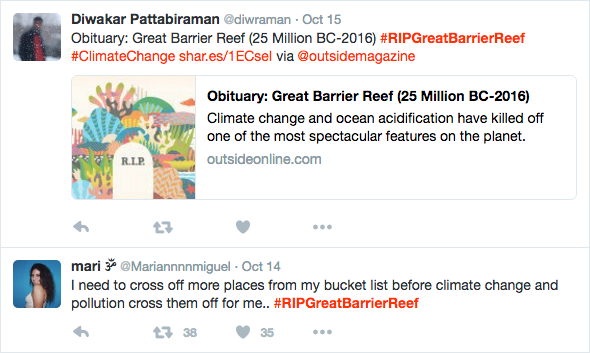 We can only hope that when these people learn that the Great Barrier Reef is still alive, their concern will turn into activism.